Boogie-Boarder Goes Missing In Waters Off Half Moon BayRescue crews were searching for an 18-year-old Hayward man who disappeared while in waters off Half Moon Bay Thursday afternoon. Scooter-Riding Oakland Thieves Nabbed in HollywoodPolice said Thursday that they've broken up a band of scooter-riding robbers from the Bay Area who busted into 40 cars over the weekend in Los Angeles. KPIX 5 News at 5:00 p.m.
(SPONSORED CONTENT) As you search for the best community for your loved one who requires senior living or Alzheimer’s care, be sure to seek out memory care. Memory care involves many techniques that can keep your loved one happier and healthier. Even when our cognitive faculties begin to go, we retain the ability to feel joy – and we often can get that experience from music. Music can help people living with dementia access memories, emotions and connections that are difficult for them to grasp otherwise. Any senior living community with memory care that you are looking at should be able to tell you just how it uses music in the lives of its residents. There are many ways to do so, from the formal to the very casual. Don’t be afraid to ask how music is integrated into activities that help people who need memory care access their memories, emotions and connections. It’s a common experience to hear a song from a certain time in your life and remember how you thought and felt back then. In memory care, music can serve this function for seniors. It can also help soothe them, direct their energy productively and even get them to communicate in a way that transcends words. Music in memory care can lead to moments of deep caring and bonding between residents and caregivers. There are many ways to integrate music into the lives of residents of senior living communities. There is a lot to be said for creating a comforting environment by playing songs from years past that resonate with the older generations, for example. This is not necessarily a type of therapy, but rather an effort staff can make to help residents feel comfortable. Listening to music with your loved one is a valuable bonding experience. Other times, music takes a background role include when a resident is agitated, when it may be very helpful to play soothing classical music to help him or her relax. This is a strategy that can combat acting out at night, which is also referred to as “sundowning.” Caregivers have also found that upbeat music can help people with dementia focus on completing a task that may be uncomfortable, like bathing, more quickly and happily. 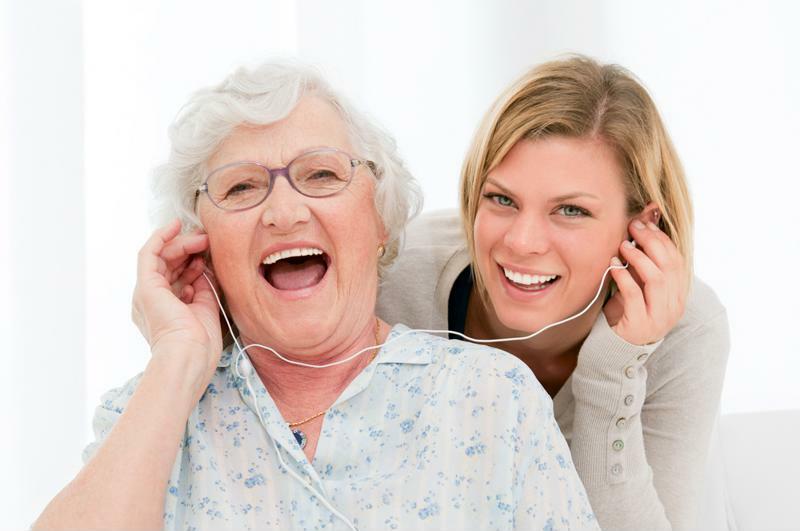 There are other more specific uses of music in memory care as well. Some communities will create specific playlists for their residents, full of songs that are meaningful to them, to facilitate sharing memories and feelings. Sometimes, people who rarely communicate verbally will be moved to sing along with a favorite song from their childhood – often a folk or religious tune. This is a precious opportunity for caregivers and loved ones to connect with people living with dementia, especially as the condition progresses and connection feels further and further away. Music with a beat can also prompt movement, whether that is tapping one’s fingers or feet or full-on dancing. Collaborating with your loved one in this movement is another way to feel close and can be a healing exercise for both of you. Ensure your loved one in need of memory care has the opportunity to feel the very real benefits of music – from unlocking memories to encouraging a dance – by selecting a senior living community with a robust selection of activities. Dr. Shirley Newell has over 30 years of health care experience. Her background includes psychiatry, urgent and tertiary care, and research. She has practiced Geriatrics and Internal Medicine in private practice. Additionally, she has worked in a number of skilled nursing facilities as staff and in leadership roles. Most recently she served as Medical Director at Symetra, where she became boarded in Insurance Medicine. Dr. Newell is currently the Chief Medical Officer for Aegis Living ensuring quality in resident care programs and overseeing their healthcare staff.